Just because Infinity Ward is gone doesn't mean Call of Duty is dead. GameStop announced today that Call of Duty: Black Ops is expected to exhibit even higher dollar pushing power than 2009's Modern Warfare 2. With last year's Call of Duty-associated release breaking $400 million on day one, this would be quite a feat. In a press release, GameStop said: "GameStop is tracking to all-time, record reservations on Call of Duty: Black Ops. We are ahead of where we were with Call of Duty: Modern Warfare 2 last year, which previously set the industry standard." Modern Warfare 2 went on to generate more than $1 billion in retail sales, so yeah, I'd call that the industry standard. 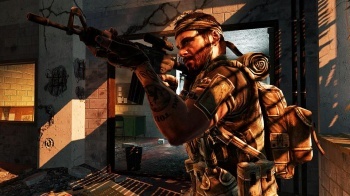 Though some may have believed that Black Ops wouldn't be able to hit the mark of Modern Warfare due to its development being handled by "B-team" Treyarch, that simply doesn't appear to be the case. Treyarch's Call of Duty: World at War didn't sell as well as Modern Warfare, but it still reached a level you could call "gangbusters." If Black Ops were a bigger success than Modern Warfare 2, it would prove that Activision's ejection of Call of Duty creators Infinity Ward may not be that much of a factor after all. As for what's bringing gamers to Black Ops in such droves, I think it's got to be the zombies.